The International Chamber of Commerce’s (ICC) biggest educational event of the year, the ICC Mediation Week, is set to take place 2-8 February 2017. Organised by the ICC International Centre for ADR, the celebrated event includes the International Mediation Roundtable and the International Commercial Mediation Competition. For mediators looking to connect, share ideas and exchange best practices, ICC Mediation Week kicks off with the 4th edition of the ICC International Mediation Roundtable on 2 February 2017. The full-day conference gathers over 120 of the world’s top dispute resolution professionals and academics to discuss current challenges and innovations in the field of mediation. The conclusion of the Roundtable marks the start of the highly anticipated, six-day ICC International Commercial Mediation Competition. 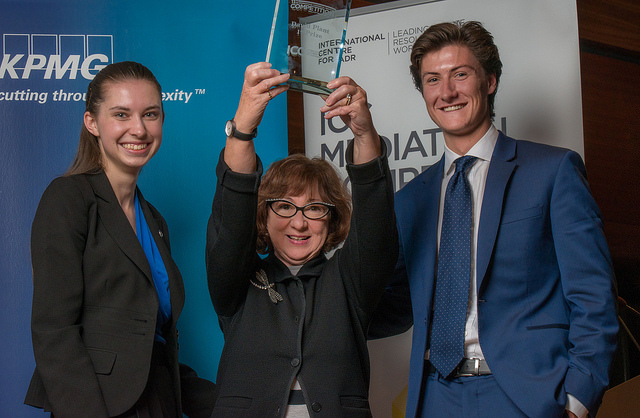 Competing for international mediation success this year are 66 university teams representing 33 countries. This edition will witness student skills from four debating countries – Greece, Austria, Turkey and Guatemala – as well as several universities featuring in the Competition for the first time, such as University of Vienna (Austria), University at Buffalo School of Law (United States) and Strathmore University (Kenya). The globally-renowned concourse, which is now in its 12th year, was originally only open to business and economy students. Today, the Competition includes students of every discipline though each team is required to have at least one law student to take the role of counsel. With almost 150 mediation sessions and a number of social events, this is a unique occasion for students to not only put theory into practice, but also allows them to make contact and gain valuable insight from the industry’s leading mediation professionals. This esteemed Competition also lends itself to unique sponsorship opportunities for law firms and other organisations looking to create ties with ICC. With over 500 international participants, the Competition provides the perfect platform to network and recruit. Long-time supporter of ICC Mediation Week, KPMG, has returned once again to be the headline sponsor, with Clifford Chance as the main supporting sponsor. ICC thanks KPMG and Clifford Chance for their generous support and contribution. Be sure to follow all ICC Mediation Week activities via ICC Mediation Facebook and Twitter and use the official event hashtag, #ICCMW. For more information regarding ICC Mediation Week, please browse our information page.